American conservative political journalism website and magazine based in Washington, D.C. The Washington Examiner is an American political journalism website and weekly magazine based in Washington, D.C. that covers politics and policy in the United States and internationally. It is owned by MediaDC, a subsidiary of Clarity Media Group, which is owned by Philip Anschutz. From 2005 to mid-2013, the Examiner published a daily tabloid-sized newspaper, distributed throughout the Washington, D.C. metro area. At the time, the newspaper mostly focused on local news and political commentary. The local newspaper ceased publication on June 14, 2013, and its content began to focus exclusively on national politics, switching its print edition from a daily newspaper to a weekly magazine format. 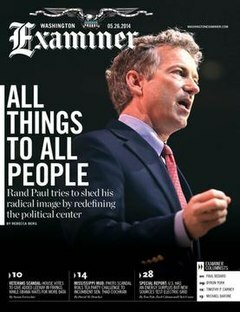 The Examiner is known for its conservative political stance and features many prominent conservative writers. The publication now known as The Washington Examiner began its life as a handful of suburban news outlets known as the Journal Newspapers, distributed only in the suburbs of Washington, under the titles of Montgomery Journal, Prince George's Journal, and Northern Virginia Journal. Philip Anschutz purchased the parent company, Journal Newspapers Inc., in October 2004. 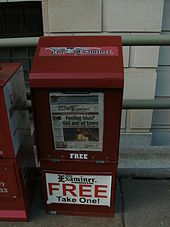 On February 1 of the following year, the paper's name changed to The Washington Examiner, and it adopted a logo and format similar to that of another newspaper then owned by Anschutz, The San Francisco Examiner. Over time, the paper became increasingly influential in conservative political circles, hiring much of the talent from The Washington Times and, over time, replaced the Times as the primary conservative paper in the capital city. The website DCist wrote in March 2013 that "Despite the right-wing tilt of its editorial pages and sensationalist front-page headlines, it also built a reputation as one of the best local sections in D.C." The newspaper's local coverage also gained fame, including a write-up by The New York Times, for contributing to the arrest of more than 50 fugitives through a weekly feature that spotlighted a different individual wanted by the authorities. It was announced in March 2013 that the paper would stop its daily print edition in June and refocus on national politics, converting its print edition to a weekly magazine and continuing to publish its website. The new format was compared to The Hill. In December 2018, Clarity Media announced that the magazine would relaunch as a publicly available, expanded print magazine. The magazine's publisher said in 2013 that it would now seek to distribute the magazine to at least "45,000 government, public affairs, advocacy, academia and political professionals." The publisher also claimed The Examiner's readership is more likely to sign a petition, contact a politician, attend a political rally, or participate in a government advocacy group than those of Roll Call, Politico, or The Hill. According to its publisher The Examiner has a high-earning and highly educated audience, with 26% holding a master's or postgraduate degree and a large percentage earning over $500,000 annually, likely to be working in executive or senior management positions. The Examiner has been described as and is widely regarded as conservative. When Anschutz first started the Examiner in its daily newspaper format, he envisioned creating a competitor to The Washington Post with a conservative editorial line. According to Politico, "When it came to the editorial page, Anschutz's instructions were explicit — he 'wanted nothing but conservative columns and conservative op-ed writers,' said one former employee." The Examiner's writers have included Michael Barone, Tim Cavanaugh, David Freddoso, Tara Palmeri, Bill Sammon, Rudy Takala, and Byron York. The Examiner endorsed John McCain in the 2008 presidential election and Adrian Fenty in the Democratic primary for mayor in 2010. On December 14, 2011, the newspaper endorsed Mitt Romney for the 2012 Republican presidential nomination, publishing an editorial saying he was the only Republican who could beat Barack Obama in the general election. In December 2018, the Washington Examiner published a story with the headline, "MAGA list: 205 ‘historic results’ help Trump make case for 2020 re-election". The story listed numerous alleged accomplishments of the Trump administration with no fact checks. The list was given to the Examiner directly from the White House for publishing, and there was no reporting rebutting anything. Shortly afterward, President Trump tweeted the story twice. In January 2019, the Washington Examiner published a story with the headline, "Border rancher: 'We've found prayer rugs out here. It's unreal'." Shortly thereafter, President Trump cited the story as justification for a border wall amid the 2018-2019 federal government shutdown. The story in question cited one anonymous rancher who offered no evidence of these Muslim prayer rugs, such as photos. The story provided no elaboration on how the rancher knew the rugs in question were Muslim prayer rugs. The author of the story formerly worked as press secretary for the anti-immigrant group Federation for American Immigration Reform. Stories of Muslim prayer rugs at the border are urban myths that have frequently popped up since at least 2005, but with no evidence to substantiate the claims. The Examiner never released a clarification or retracted the story. ^ Rothstein, Betsy (December 5, 2014). "Shake-Up At The Washington Examiner". The Daily Caller. Retrieved August 25, 2015. ^ Rothstein, Betsy (March 23, 2015). "Washington Examiner Ups Philip Klein to Managing Editor". The Daily Caller. Retrieved August 25, 2015. ^ a b c Freed, Benjamin R. (March 19, 2013). "Washington Examiner to Cease Daily Publication and Become Political Weekly Archived 2013-07-28 at the Wayback Machine". DCist. Retrieved July 5, 2013. ^ MediaDC website. Retrieved July 5, 2013. ^ "New Examiner to offer online reporting, weekly magazine". (June 13, 2013). Washington Examiner. Retrieved July 5, 2013. ^ a b c Calderone, Michael (October 16, 2009). "Phil Anschutz's Conservative Agenda". Politico. ^ "Weekly Standard acquired by Washington Examiner parent company". Washington Examiner. June 16, 2009. Retrieved March 22, 2019. ^ Connolly, Matt. (June 14, 2013). "The Washington Examiner local news team says goodbye after eight years". The Washington Examiner. Retrieved July 5, 2013. ^ a b Lauter, David. "As 2017 ends, Republicans struggle to counter a Democratic wave". latimes.com. Retrieved September 18, 2018. ^ a b "Heresy on the Right". Columbia Journalism Review. Retrieved September 18, 2018. ^ a b Sommer, Will (February 2, 2018). "Chuck Todd: Fox News obtaining memo excerpts early ' smacks of a partisan exercise'". TheHill. Retrieved September 18, 2018. ^ a b Robertson, Lori (April/May 2007). "Home Free". American Journalism Review. Retrieved July 5, 2013. ^ Helman, Christopher. "The Man Behind the Curtain" (October 21, 2010). Forbes. Retrieved July 9, 2013. ^ a b "Washington Examiner Newspaper Closing, Becoming Weekly Magazine". www.outsidethebeltway.com. March 19, 2013. Retrieved July 17, 2016. ^ Peters, Jeremy W. (December 12, 2010). "Washington Examiner Helps Capture Fugitives". The New York Times. Retrieved July 5, 2013. ^ a b Bloomgarden-Smoke, Kara. (March 19, 2013). "The Washington Examiner Announces a 'Shift' in Their Business Model". Retrieved July 5, 2013. ^ Rogers, Jenny (August 11, 2014). "Stephen Smith Is Out at Washington Examiner". Washington City Paper. Retrieved August 12, 2014. ^ "Press Release: Washington Examiner to Expand into a Nationally Distributed Magazine with a Broadened Editorial Focus". Washington Examiner. December 3, 2018. Retrieved December 6, 2018. ^ a b "MediaDC | Audience and Readership". influence.mediadc.com. Archived from the original on July 11, 2016. Retrieved July 17, 2016. ^ "The Examiner endorses McCain-Palin". The Washington Examiner. September 24, 2008. Retrieved May 13, 2018. ^ "Why Fenty deserves – and D.C. needs – four more years". The Washington Examiner. September 7, 2010. Archived from the original (editorial) on December 4, 2010. ^ "Influential Conservative Newspaper Backs Romney for GOP Nomination". Fox News. December 14, 2011. Retrieved May 25, 2012. ^ Moran, Lee (January 2, 2019). "Donald Trump Gets Busted Boasting About Positive News Coverage Written By Own Aides". Huffington Post. Retrieved January 24, 2019. ^ AM, Dan Cancian On 1/2/19 at 9:13 (January 2, 2019). "Trump boasts about positive coverage, neglects to note it came from the White House". Newsweek. Retrieved January 24, 2019. ^ Sommer, Will (January 18, 2019). "Trump Tweets Discredited Right-Wing Meme About 'Muslim Prayer Rugs' at Border". Retrieved January 20, 2019. ^ Graham, David A. (January 18, 2019). "Trump's Entire Shutdown Approach, Encapsulated in One Tweet". The Atlantic. Retrieved January 20, 2019. ^ Oprysko, Caitlin. "Trump touts story about finding 'prayer rugs' along border". POLITICO. Retrieved January 20, 2019. ^ "Trump uses migrant caravan, prayer rugs to defend border wall, despite little proof - National | Globalnews.ca". globalnews.ca. January 18, 2019. Retrieved January 20, 2019. ^ Qiu, Linda (January 18, 2019). "Trump's Baseless Claim About Prayer Rugs Found at the Border". The New York Times. ISSN 0362-4331. Retrieved January 20, 2019. ^ "Trump points to a migrant caravan and unverified claim about Muslim prayer rugs as he continues push for wall". The Washington Post. 2019. 2013 disestablishments in Washington, D.C. This page was last edited on 14 April 2019, at 03:18 (UTC).